Judges, welcome back to this week’s edition of Judge of the Week! Featured this week is Kyle Knudson, whose renowned presentation skills come at least in part from his Theater chops! 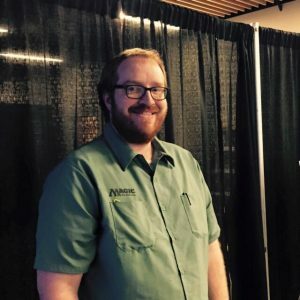 Occupation: Logistics Expert and Event Operations Manager, Cascade Games. We don’t really have titles, so every time I have to write this I come up with something slightly different. Least favorite card: Anything that keeps someone from being able to actually play. Standstill, Blood Moon, etc. 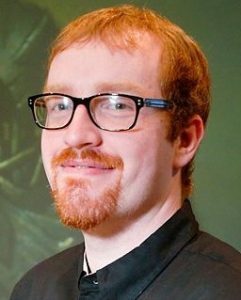 Magic is a Multiplayer game. Favorite format: Commander, although I don’t get to play very often. Commander General: I built Sliver Queen as my first Commander Deck. Not because I wanted to do degenerate things, but because I didn’t want to keep myself to one color. I stayed as far away from “win the game” combos as possible because Commander is about the journey, not the result. Favorite non-Magic Game: Lately I’ve been enjoying games where you have to bluff. Coup, Resistance, Werewolf, etc. Best tournament result: Non-Magic – Top 8 of a Spoils $13k (kind of like an Open Series style event). 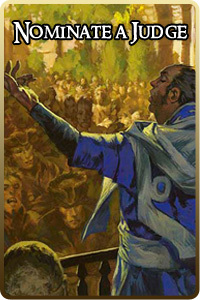 Magic – I think I’ve taken 1st at FNM once or twice. I Judge for the community. I Judge because I love giving people the opportunity to have fun. I Judge because I like the energy in the room when people are excited. You were nominated through the Exemplar Program. Tell us about your ability to present on nearly any topic. I mentioned above about being into Theater. I did a lot of improv (mostly for fun). Thinking on my feet is something I am good at. I also have done a lot of things in the Magic community and have a lot of experiences I can draw off of. I also don’t hate being the center of attention 😛 The combination of those things means that even with little notice I can fill 30-60 minutes with stories that people can learn from or driving a discussion that helps people grow and learn. 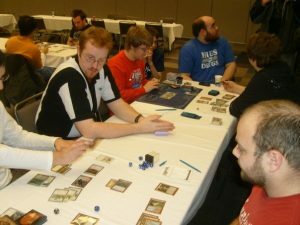 After GP San Diego last year we had a Judge Conference. I was talking with David Zimet beforehand about wanting to present, but not knowing what would be a good topic to present about. He suggested ‘Managing Stress: Functioning During Conflict.’ This is something I’ve had some experience with over the last year or so, and it’s something many Judges have to deal with from time to time, but usually not often enough to really practice or understand how to operate well under stressful conditions. The Morning of the conference came and there was an issue with the space we were using. There was an airwall that was supposed to separate two of our rooms so that we could have 3 sessions going at once. We kept trying to get the Convention Center Staff to come close the airwall, but they had another event happening and couldn’t get to us in time. So at the last minute we merged my talk with another and had a larger session with Billy San Juan , Tim Shields and I about the psychological effects of going on tilt. It was a blast and many of the people who sat in said they learned a lot. No mistake is ever so big that it can’t be fixed. You will never break something so bad that it can’t be put back together. Don’t be afraid. 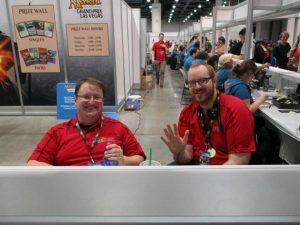 At the end of Grand Prix Vegas 2015 we had a meeting room in the Vegas Convention Center with probably 200 Judges in it all playing Magic, eating Pizza, and celebrating at the end of a weekend that won’t soon be matched. One of the biggest challenges I faced growing as a Judge is grappling with my own confidence. When I was starting out in the program I would constantly second guess myself. I would be timid when giving rulings, I would waffle back and forth about how to do the simplest tasks. I was so afraid of messing up that I was doing more harm than good to events. Even the smallest thing felt like if I messed it up the entire event would grind to a halt and it would be my fault. I came to learn after many conversations, many events, many times at the plate that the mistakes that your average Floor Judge can make have almost no impact on the overall outcome of the event. Even if you do something and cause a 10 minute delay (which feels like an eternity while it’s happening) that only means that your event ends at 9:40 instead of 9:30. It was all about perspective, and knowing that I wasn’t going to negatively impact anyone’s Destiny. Now, this could suggest that what we do at events doesn’t matter. If my mistakes don’t impact the event then how can my contributions? Think of it this way: If you put up pairings on the back of the pairings board instead of the front, that is unfortunate and probably irritates some folks. If you don’t put them up at all, the event doesn’t happen. The things you do, no matter how small, are all part of what makes Magic events happen. You never know when the thing you do becomes the next innovation that changes how we all do things. If there is little risk to making mistakes, then you should always look for new ways to do things. Ways to make things better. At the end of the day, your mistakes might cause delays or create a little work for someone, but what you do can change the world. I drink an unhealthy amount of energy drinks, often taking advantage of sales buying hundreds of cans at a time. I love roller coasters, I once spent all day at a 6 flags in Texas just riding roller coasters. Elias reveals that he is not actually married. So proud of our awesome son!!! !